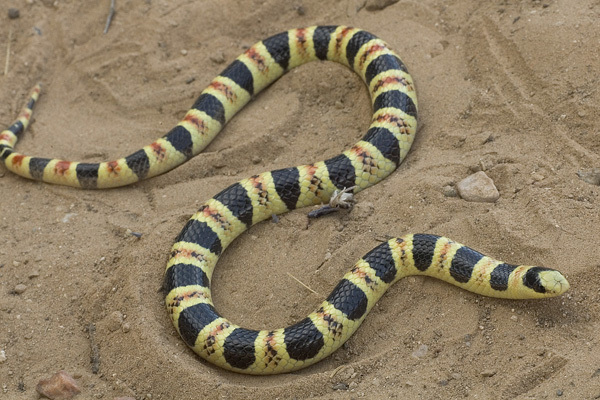 The Tucson Shovel-nosed Snake lives in the northern Sonoran Desert in Arizona's sandy valleys. Adapted for the desert substrate the TS-nS swims through the sand preying primarily on scorpions, spiders, and bettle larvae. This subspecies of the Western Shovel-nosed Snake is at home in the arid Arizona climate. However, the rapid loss of habitat has greatly threatened the existence of this tiny reptilian predator. Surrounded by several growing communities the Tucson Shovel-nosed Snake has lost over 2/3rds of its natural range to urban sprawl and agriculture. Without immediate federal protection this precious snake will continue to go unnoticed and will eventually vanish. Development is understandable but it must be done with forbearance and an attitude of stewardship towards the Sonoran Desert, a truly special place to live. We must act now to preserve the natural beauty that surrounds our communities, we owe it to our children and ourselves.